Build strength in biceps, triceps, shoulders and core with this strong quick flow created for beginners. 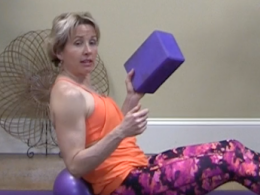 Have fun with the "purple ball" in this short but intense core workout. You will feel the core "love". Back by request, a killer leg and booty flow, walking will be optional after this class. Kick your core's booty with this intense core workout designed to ignite the deep layers of the core. Kick your core's booty in this quick but oh so challenge core workout! Build strength in biceps, triceps, shoulders and core in this quick flow designed to focus on upper body. Build core strength in the deep layers of the core with this focused quick workout. Ignite the core and whittle the waistline in this quick workout you can easily fit into any day. 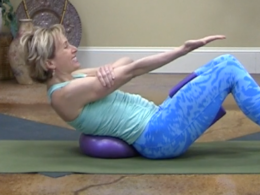 Quick core workout that will blast your core and build strength in the deep layers of the TVA. Quick intense leg workout with a few cardio bursts to amp up the calorie burn. Build full body strength is this quick plank workout guaranteed to challenge you! 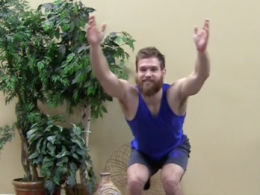 Fire up the deep layers of the TVA in this quick, intense core workout. Core and waistline whittlers added to this intense plank workout. Take plank to a new level by adding in forearm and full plank for upper body, legs and core workout. Take your plank around the world as you create new found strength and kick your own booty. Ignite your core and build your strength in this quick workout that focuses on igniting the TVA. Be ready to sweat in this intense plank challenge. Ignite your core in this quick workout. Fuel your full body strength from the core with this intense, quick core workout. Work quads, hamstrings, core in this shore intense leg workout. Fire up your core and ignite strength in the entire body with this intense quick core workout. Build strength in biceps, triceps, shoulders and core with this plank and upper body workout. Create lean and muscular legs with this quick intense leg workout. Fire up your strength with this intense core and upper body workout. Create strength in your legs - quads, hamstrings,calves while engaging your core in just 10 min. Isolate the strength in your core with this intense 10 minute workout. Engage your core and isolate your strength with the quick, challenging core workout. Isolate your core strength with this quick intense workout! Kick your own core in just 5 min! Kick your own core in just 10 min. Build strength in triceps, biceps, shoulders and core in this strong 10 minute workout. Short and intense workout that will make your core quiver! Intense full body workout that isolates strength in the core, upper body and legs. Isolate strength in your core with this short, intense class. Build upper body strength with the band as a prop. Kick your own booty in this intense core and full body workout. Quick calorie burn in this strong core igniting class. Short but strong core workout. Engage your core and build full body strength in this intense workout class. Strong and intense calorie burning, metabolism building class. Kick your body into high gear strength with this intense strength building workout. Booty kicking core combined with upper body and legs workout. Calorie torching full body workout. 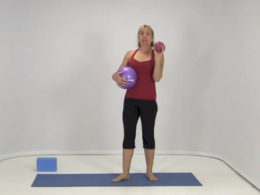 Work away the waistline with this purple ball workout that isolates core strength in the obliques and TVA. Kick your own core in this short instense workout. Intense workout designed to build strength in the entire body - feel the quiver of your core! Kick your own booty in this powerful class that isolates strength building in the core, upper body and legs. Build full body strength in this challenging calorie burning class. Isolate your core muscles and build strength.